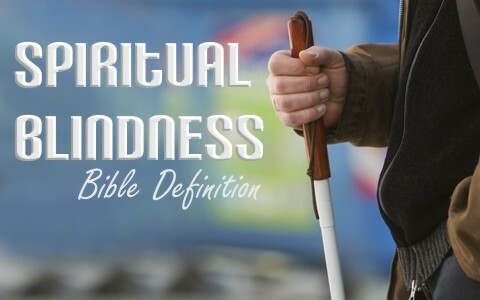 What is spiritual blindness? Have you even heard of it? What does the Bible say about it? Jesus had just been speaking with some teachers and the Pharisees who had just rebuked Him for their disciples not following their traditions (Matt 15:1-2) so Jesus told them that they had been doing far worse. They had been neglecting their parents and covering up their neglect by calling it a work of God (Matt 15:3-6), thereby breaking the commandment to honor their parents so Jesus called them what they were; hypocrites (Matt 15:7). His disciples seemed concerned and told Jesus “Do you know that the Pharisees were offended when they heard this” (Matt 15:12) but Jesus told the disciples “Leave them; they are blind guides. If the blind lead the blind, both will fall into a pit” (Matt 15:14). What did Jesus mean that they were blind? Earlier, He had referenced the Prophet Isaiah who wrote about them, as he said, “This people honors me with their lips but their heart is far from me” (Matt 15:8) so apparently, they were blinded to the Old Testament prophecies about Jesus since they were so far from God. Great distances don’t make vision any better. The Apostle Paul constantly encountered different gospels which weren’t really gospels at all. These unbelievers were blind to the true Light of the World and so they sought to imitate it but Paul wrote “even if our gospel is veiled, it is veiled to those who are perishing. In their case the god of this world has blinded the minds of the unbelievers, to keep them from seeing the light of the gospel of the glory of Christ, who is the image of God” (2 Cor 4:4-4). Satan is sometimes called the “Prince of Darkness” and he has his own ministers who appear good and even as “angels of light” (2 Cor 11:4), but the Devil and his demons really hate the light so they’ll try to distort it or twist it and take it out of context. If he can keep people in darkness, they’ll be blinded by it and unable to see the light, but God has overcome the darkness, in Jesus Christ (John 1:4-5). For us who believe, God “said, “Let light shine out of darkness,” has shone in our hearts to give the light of the knowledge of the glory of God in the face of Jesus Christ” (2 Cor 4:6). It was for all “who believed in his name, he gave the right to become children of God, who were born, not of blood nor of the will of the flesh nor of the will of man, but of God” (John 1:12-13). We were made to see the light; otherwise we’d still be in darkness too and not even know it. We shouldn’t think harshly toward the unsaved. Rather, we ought to be moved with compassion and feel compelled to witness to them about the Light, for as they are now, we once were. We are in no way better than they are. We are only in a better position as far as the wrath of God not abiding on us anymore (John 3:36b), having been redeemed by the precious blood of the Lamb of God (1 Pet 1:19). The main difference between us and the lost is that God sent us His Spirit. It was only when we were convicted by the Holy Spirit of our sins that we too cried out like the crowd gathered on the Day of Pentecost, “What shall we do” (Acts 2:37). For those of us who are saved, we saw the need to repent and believe, which is exactly the same message that Jesus spoke as He began His earthly ministry (Mark 1:15). The main reason that we came to know Christ was by the work of the Spirit of God Who made us aware of our sins (Rom 7) and the need to be forgiven but first we had to humble ourselves before God. God will never give His grace to anyone who is proud; He will only extend His grace to the humble (James 4:6), and to be humble means you are more open to the gospel of Jesus Christ and to receive the free gift of eternal life (Eph 2:8). We must ask the question; what is it that blinds people? What leads to spiritual blindness? I believe it is in the choices we make. One way to guarantee that someone’s going to be spiritually blind is if they mock God (Isaiah 37:23), scoff at the idea of their even being a god (2 Pet 3:3; Jude 1:18), declare that there is no God (Psalm 14:1), and reject the true Son of God (John 3:36b; John 12:48) All they are doing, God says, is “storing up wrath for yourself on the day of wrath when God’s righteous judgment will be revealed” (Rom 2:5) and for all who “do not obey the truth, but obey unrighteousness, there will be wrath and fury” (Rom 2:8). To remain blind, all anyone has to do is to do “the works of the flesh [which] are evident: sexual immorality, impurity, sensuality, idolatry, sorcery, enmity, strife, jealousy, fits of anger, rivalries, dissensions, divisions, envy, drunkenness, orgies, and things like these” and so Paul writes, “as I warned you before, that those who do such things will not inherit the kingdom of God” (Gal 5:19-21). If you have never received by faith the Light of the World, Jesus Christ by faith, then there is no reason you cannot do so right at this moment. You need to recognize that your sins are an affront to a holy God and these sins have cut you off from a holy God (Isaiah 59:2), but the cross of Christ has bridged the gap that could never have been closed for you to crossover into the kingdom. When we turn to God and place our trust in Christ, we will see the Light, but until we humble ourselves, we will remain in darkness, and that’s a place that we will remain in utter horror, forever and ever. Jesus said of those who reject Him, “Bind him hand and foot and cast him into the outer darkness. In that place there will be weeping and gnashing of teeth” (Matt 24:13). “What leads to spiritual blindness? I believe it is in the choices we make.” You got that right. Only gotta do two things in life: 1) Make choices and 2) live with the consequences. Sometimes good and sometimes bad. Thanks for another great article brother! Previous post: What Is A Bible Commentary? How Should Commentaries Be Used?